Area: 33,843 sq. km. (13,000 sq. mi. ); slightly larger than Maryland. Terrain: Rolling steppe, gradual slope south toward the Black Sea. Climate: Moderate winters, warm summers. Nationality: Noun — Moldovan(s). Adjective — Moldovan. Population (January 1, 2011): 3.56 million living in-country, not including the estimated Transnistrian population of 533,000. An estimated 750,000 to 1,000,000 work outside the country. Population growth rate (2007): -0.3%. Ethnic groups (2004 census): Moldovan (75.8%), Ukrainian (8.3%), Russian (5.9%), Gagauz (4.4%), Bulgarian (1.9%), Romanian (2.2%), other (1.5%). Religions: Christian Orthodox (96%); adherents of other religious groups include Roman Catholics, Baptists, Pentecostals, Seventh-day Adventists, Muslims, Jehovah's Witnesses, Baha'is, Jews, members of the Unification Church, Molokans (a Russian group), Messianic Jews, Lutherans, Presbyterians, and charismatic and evangelical Christian groups. Health: Infant mortality rate: 11.7/1,000. Life expectancy — 69.1 years. Work force (1.235 million): Agriculture — 27.5%; industry — 12.8%; construction — 5.9%, services — 53.8%. Constitution: Adopted July 28, 1994. Independence: August 27, 1991 (from Soviet Union). Branches: Executive: President (head of state), Prime Minister (head of government), government (cabinet). Legislative — unicameral Parliament. Judicial — Supreme Court. Administrative subdivisions: 32 counties (raions), 4 municipalities, and one autonomous territorial unit. Political parties with seats in Parliament: Party of Communists, Liberal Democratic Party, Democratic Party, Liberal Party. GDP growth rate (2010): 6.9%. Per capita GDP (2010 estimate): $1,631. Natural resources: Lignite, phosphates, gypsum, arable land, and limestone. Agriculture: Products: vegetables, fruits, wine and spirits, grain, sugar beets, sunflower seeds, meat, milk, eggs, tobacco, walnuts. Industry: Types: processed foods and beverages, including wine and refined sugar; processed fruit and vegetable products, including vegetable oil; dairy and meat products; tobacco items; metal processing and production of machinery; textiles and clothing, shoes; furniture. Trade (2010): Exports: $1.582 billion (of which 47% went to EU countries and 39% to the countries of the former Soviet Union): textiles, clothing, foodstuffs, wine, and machinery. Major markets — Russia, Romania, Italy, Ukraine, U.K., Turkey, Belarus, Germany, and Poland. Imports — $3.855 billion (of which 44% came from the EU and 33% from the former Soviet Union): gas, oil, coal, steel, machinery and equipment, chemical products, textiles, foodstuffs, automobiles, and other consumer durables. Major suppliers — Russia, Ukraine, Romania, China, Germany, Italy, Turkey, Belarus, Poland, and Greece. 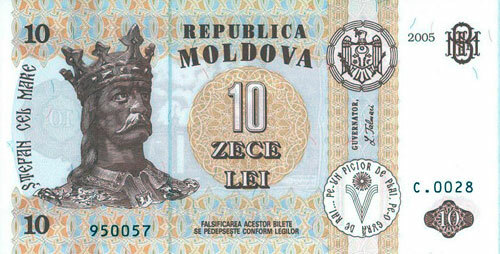 Currency: Moldovan Leu (plural Lei). Exchange rate (Leu/U.S.$): 12.37 (2010 average); 11.11 (2009 average); 10.39 (2008 average). Ethnic groups represented in Moldova include Moldovan/Romanian, Ukrainian, Russian, Gagauz, and Bulgarian. Romanian (officially known as Moldovan) is the official language; Russian, Ukrainian, and Gagauz are also spoken. The great majority of Moldova's population is Christian Orthodox — 96% of the population nominally belongs to one of the two main Orthodox denominations. The Moldovan Orthodox Church (MOC), an autonomous diocese of the Russian Orthodox Church and subordinate to the Patriarch of Moscow, has 1,281 component parts, including churches, monasteries, and other buildings; the Bessarabian Orthodox Church (BOC), subordinate to the Romanian Orthodox Patriarchate in Bucharest, has 309 component parts. Followers of the Old Rite Russian Orthodox Church (Old Believers) have 15 component parts. The government does not seek out or record the number of adherents of religious organizations. A February 2011 international poll found that 87% of respondents identified themselves as members of the MOC, and 6% identified themselves as members of the BOC. Traditional churches, such as the BOC and the Roman Catholic Church, have faced difficulties getting back properties that were expropriated under Nazi and Soviet rule; the MOC has faced no such difficulties. The Republic of Moldova occupies most of what has been known as Bessarabia. Moldova's location has made it a historic passageway between Asia and southern Europe, as well as the victim of frequent warfare. Greeks, Romans, Huns, and Bulgars invaded the area, which in the 13th century became part of the Mongol empire. An independent Moldovan state emerged briefly in the 14th century and grew in territory under celebrated leader Stefan the Great in the 15th century but subsequently fell under Ottoman Turkish rule in the 16th century. After the Russo-Turkish War of 1806-12, the eastern half of Moldova (Bessarabia) between the Prut and the Dniester Rivers was ceded to Russia, while Romanian Moldavia (west of the Prut) remained with the Turks. Romania, which gained independence in 1878, took control of Russian-ruled Bessarabia in 1918. The Soviet Union never recognized the action and created an autonomous Moldavian republic on the east side of the Dniester River in 1924. In 1940, Romania was forced to cede Bessarabia to the Union of Soviet Socialist Republics (U.S.S.R.), which established the Moldavian Soviet Socialist Republic by merging the autonomous republic east of the Dniester and the annexed Bessarabian portion. Stalin also stripped the three southern counties along the Black Sea coast from Moldova and incorporated them in the Ukrainian Soviet Socialist Republic. Romania sought to regain Bessarabia by joining with Germany in the 1941 attack on the Soviet Union. On June 22, 1941, German and Romanian troops crossed the border and deportations of the Jews from Bessarabia began immediately. By September 1941, most of the Jews of Bessarabia and Bukovina had been transported in convoys and force marched to concentration camps in Transnistria. About 185,000 Jews were in the Transnistria area in concentration camps by 1942 in abysmal conditions. Very few were left alive in these camps when the Soviets reoccupied Bessarabia in 1944. In September 1990, the Supreme Soviet elected Mircea Snegur as President of the Soviet Socialist Republic of Moldova. A former Communist Party official, he endorsed independence from the Soviet Union and actively sought Western recognition. On May 23, 1991, the Supreme Soviet renamed itself the Parliament of the Republic of Moldova, which subsequently declared its independence from the U.S.S.R.
From August 1991, Moldova's transition to democracy confronted a series of obstacles, including an ineffective Parliament, the lack of a new constitution, a separatist movement led by the Gagauz (Christian Turkic) minority in the south, and unrest in the Transnistria region on the left bank of the Nistru/Dniester River, where a separatist movement declared a "Transdniester Moldovan Republic" in September 1990. The Russian 14th Army intervened to stem widespread violence and support the Transnistrian regime. In 1992, the government negotiated a cease-fire arrangement with Russian and Transnistrian officials, although tensions continue, and negotiations are ongoing. In February 1994, new legislative elections were held, and the ineffective Parliament that had been elected in 1990 to a 5-year term was replaced. A new constitution was adopted in July 1994. The conflict with the Gagauz minority was defused by the granting of local autonomy in 1994. The current Moldovan government was elected in November 2010 and took office in January 2011 in a peaceful transfer of power. Three of the four parties that had formed the Alliance for European Integration (AIE) re-established the coalition government with a parliamentary majority consisting of 59 members of Parliament out of 101. Liberal Democratic Party leader Vlad Filat (PLDM, 32 seats) was re-elected Prime Minister. Democratic Party leader Marian Lupu (PD, 15 seats) became Speaker of Parliament and Acting President, and remains the AIE candidate for President. The Liberal Party (PL, 12 seats) is led by Mihai Ghimpu, former Acting President of the AIE coalition government from 2009 through the end of 2010. Our Moldova Alliance, led by Serafim Urechean, failed to pass the 4% threshold and in April 2011 merged with PLDM. Two weeks later Urechean was appointed Chairman of the Court of Auditors. The Communist Party (PCRM) remains in opposition, holding 42 seats in Parliament. Mihai Godea was the leader of the PLDM faction in Parliament, but defected in May 2011 to become an independent member and run for Mayor of Chisinau. Ghimpu served as Acting President from September 2009 to January 2011, when Marian Lupu took over the office of Speaker and the office of Acting President. The AIE coalition failed twice in November and December 2009 to attract the additional eight votes required (61 total) for the Parliament to elect Lupu, which meant that Ghimpu was constitutionally required to dissolve Parliament and call new elections. A September 5, 2010 referendum to replace the system of parliamentary election of the president with direct popular election failed because of low turnout. Parliament was dissolved September 28 in preparation for new parliamentary elections on November 28, 2010. In those elections, the AIE scored a 59-seat majority in Parliament, falling two seats short of the 61 votes constitutionally required to elect a President. The Alliance parties did not initiate the process of presidential elections as they did not have the two votes needed for the procedure to be successful. Instead, the AIE asked the Constitutional Court to interpret Article 78 of the Constitution, pointing to the lack of legal provisions that would forbid repeated dissolution of Parliament after failing to elect a President, and sought the Court's opinion regarding the propriety of adopting a law that would allow Parliament to elect a President with fewer votes, thus altering Article 78. The Court has 6 months to provide an opinion. In the meantime, the Constitutional Court requested that the Venice Commission provide a consultative opinion. The AIE government has launched an ambitious reform effort and placed a clear priority on Moldova's relations with the West and integration with the European Union. It has pledged to respect and promote human and civil rights, improved relations with neighboring Romania, and negotiated a difficult agreement with the International Monetary Fund (IMF) to help alleviate the effects of the global economic crisis. The Government of Moldova generally recognizes freedom of religion in practice, although it has continued to deny registration to some religious groups. A new law on religion, passed in July 2007, liberalized registration procedures for religious groups, transferred responsibility for registration from the State Service for Religion to the Ministry of Justice, and permitted congregations to switch denominational allegiance. Of the 24 groups that submitted applications after the new procedures came into effect, only the Unification Church, the Armenian Christian Apostolic Denomination, and the Ukrainian Orthodox Patriarchate have been successfully registered. Orthodox Christian, Muslim, and Protestant organizations continue to encounter bureaucratic obstacles to registration, and Jehovah's Witnesses recount numerous instances of social discrimination and abusive behavior. In August 2009, the majority Moldovan Orthodox Church successfully blocked a concert by Seventh-day Adventists in the public square next to the Orthodox cathedral. In December 2009, a menorah displayed in a public square was dismantled and removed by members of an Orthodox Christian group, whose leader recited anti-Semitic rhetoric. The Government of Moldova publicly condemned the event, and the menorah was reassembled a few blocks away at the Holocaust Memorial without further incident. In December 2010, the lighting of the menorah was celebrated on the private grounds of the Kedem Jewish Community Center. The official registration of the Islamic League in March 2011 was met with protests by the Party of Communists and by Orthodox Christian and Romanian nationalist groups. Despite these protests, the government has not rescinded the registration. A number of minority religious groups in the breakaway region of Transnistria, which is not under the control of the Moldovan Government, have continued to be denied registration and are subjected to harassment by Transnistrian authorities. The population of the Moldovan region of Transnistria, which includes most of the land between the Nistru/Dniester River and the Ukrainian border as well as the city of Tighina/Bender, is approximately 40% Romanian/Moldovan, 28% Ukrainian, and 23% Russian (est.). Separatist forces maintain control of the Transnistrian region. Moldova has offered the region rather broad cultural and political autonomy. The dispute has strained Moldova's relations with Russia. Tensions grew between the central government in Chisinau and predominantly Russian-speaking Transnistria after the adoption of the law that established Romanian as the official language in the Republic of Moldova in 1989 and degenerated into an armed conflict in the spring and summer of 1992. The July 1992 cease-fire agreement signed by Moldovan President Snegur and Russian President Yeltsin established a tripartite peacekeeping force comprised of Moldovan, Russian, and Transnistrian units. Negotiations to resolve the conflict continue, and the cease-fire is still in effect. The Organization for Security and Cooperation in Europe (OSCE) is trying to facilitate a negotiated settlement and has had an observer mission in place since 1993. In July 2002, OSCE, Russian, and Ukrainian mediators approved a document setting forth a blueprint for reuniting Moldova under a federal system. Over the next year and a half, the settlement talks alternated between periods of forward momentum and periods of no progress. In February 2003, the U.S. and European Union (EU) imposed visa restrictions against the Transnistrian leadership. In April 2003, the Moldovan Government and the Transnistrian authorities agreed to establish a joint commission to draft a constitution for a reintegrated state. However, fundamental disagreements over the division of powers remained, and a settlement proved elusive. President Vladimir Voronin decided not to sign a Russian-brokered settlement with Transnistria in November 2003; the proposal — seen by many as not in Moldova's best interest — sparked opposition protests. During the summer of 2004, the Transnistrian separatists forcibly closed several Romanian language Latin-script schools in the region, for which the regime was subject to international condemnation. In 2005, the Transnistrian regime prevented farmers on the right bank of the Nistru River from working their fields on the left bank. The OSCE Mission to Moldova eventually mediated solutions to these crises. After a 15-month pause, the sides met for a renewed round of settlement negotiations in October 2005. Mediators from Ukraine, Russia and the OSCE joined the Moldovan and Transnistrian representatives at the talks. In addition, the U.S. and EU joined the talks as observers. However, subsequent "5+2" negotiations have made little progress on a settlement or on withdrawal of Russian forces from Moldova: Russia still has weapons and munitions of the Operational Group of Russian Forces (formerly the Russian 14th Army) stationed in Transnistria, although it pledged to remove them under a timetable established at the 1999 OSCE Ministerial — the so-called "Istanbul Commitments." However, there has been no progress on Russian withdrawals since early 2004. In response to Moldova's call for international monitoring of the border, in December 2005 the EU dispatched a Border Assistance Mission (EUBAM) to help stem the flow of illegal trade across the eastern border with Ukraine. In March 2006, Ukraine and Moldova began implementing a May 2003 customs agreement, under which Transnistrian companies seeking to engage in cross-border trade must register in Chisinau. Despite the protests of Transnistrian leader Igor Smirnov, most major Transnistrian businesses have subsequently registered. In what is seen as a response to the new customs procedures, the Smirnov regime began a boycott of formal 5+2 talks in March 2006, which stalled negotiations for several years. Since then, the 5+2 has been able to meet only for informal discussions. Hopes that the 5+2 meeting in Moscow on June 21, 2011 would decide upon the resumption of formal talks were not met. In 2008 Chisinau authorities proposed creation of joint Moldova-Transnistria confidence-building measures working groups (CBMs WG) at the level of deputy ministers to address outstanding issues in economy and trade, transportation, ecology, healthcare, humanitarian aid, and other areas. The activity of these groups ceased during parliamentary campaigns and government change in Moldova in 2009 and resumed with new faces on the Moldovan side of the table in late 2009. With the exception of the healthcare WG, which managed to maintain more or less constant cooperation and ensured resolution of some practical issues, the records of all other WGs varied from exchange of information to no results. Moldova's embassy in the United States is at 2101 S Street NW, Washington, DC 20008 (tel: 202-667-1130; fax 202-667-1204). More information about Moldova can be found at the official Government of Moldova website at (http://www.moldova.md/en/start/). Moldova is one of the poorest countries in Europe. It is landlocked, bounded by Ukraine on the east and Romania to the west. It is the second-smallest of the former Soviet republics and the most densely populated. Industry accounts for less than 15% of its labor force, while agriculture's share is more than one-quarter. The country lacks mineral resources and is almost fully dependent on imports of energy inputs (gas, oil, and coal). Moldova's proximity to the Black Sea gives it a mild and sunny climate. This makes the area ideal for agriculture and food processing, which accounts for one-third of the country's GDP. The fertile soil supports wheat, corn, barley, tobacco, sugar beets, and soybeans. Beef and dairy cattle are raised, and beekeeping is widespread. Moldova's best-known product comes from its extensive and well-developed vineyards concentrated in the central and southern regions. In addition to world-class wine, Moldova produces liqueurs and champagne. It is also known for its sunflower seeds, walnuts, apples, and other fruits. Like many other former Soviet republics, Moldova has experienced economic difficulties. Since its economy was highly dependent on the rest of the former Soviet Union for energy and raw materials, the breakdown in trade following the breakup of the Soviet Union had serious economic and social effects, exacerbated at times by drought and civil conflict. The Russian ruble devaluation of 1998 had a deleterious effect on Moldova's economy, which only started to rebound in 2000 after years of recession since independence. From 2000 to 2008, the country's economic growth averaged 6.3% (just below the average for the region) and was driven primarily by consumption fueled by remittances from Moldovan migrant workers. Even though affected by a two-fold increase in gas prices and a politically-motivated Russian ban on Moldovan wine imports in 2006, a severe drought in 2007, and floods in 2008, the economy proved resilient. The country was less prepared for the global crisis, which started to take its toll in the fall of 2008, despite an impressive growth rate of 7.8% for that year. With the onset of the global financial crisis and poor economic conditions in Moldova's main foreign markets, GDP dropped 6% in 2009. In 2010, an upturn in the global and regional economy boosted GDP growth to an impressive 6.9% despite a period of extended political transition and polarization. The growth was broad-based and is expected to continue into 2011 as a sign of Moldova's overcoming the economic crisis of 2009. Moldova has made progress in economic reform since independence. The government has liberalized most prices and has phased out subsidies on most basic consumer goods. A program begun in March 1993 has privatized the vast majority of all housing units and nearly 2,000 small, medium, and large enterprises. Other successes include the privatization of nearly all of Moldova's agricultural land from state to private ownership, as a result of an American assistance program, "Pamint" ("land"), completed in 2000. A stock market opened in June 1995. Following the economic difficulties caused by the Russian currency crisis of 1998, the country has had some success in reducing inflation, even though keeping it at single-digit levels has proved challenging. It was only in 2008 that inflation dropped below 10% — for the first time in recent years — to 7.3%. Owing to the global crisis that triggered deflationary pressures, inflation fell further to 0.4% in 2009, the lowest level since Moldova's independence. In 2010, as the country was emerging from the global crisis-induced recession, inflation accelerated to 8.1% owing to higher food prices and energy tariffs. After previous years of relative stability and gradual appreciation because of a weakening U.S. dollar and growing remittances from Moldovans working abroad, the value of the local currency, the Moldovan leu, eroded somewhat in 2009. Reforms to the National Bank of Moldova in 2006 changed the central bank's policy priority from currency stability to price stability (fighting inflation). Faced with the formidable task of sterilizing the money supply to contain inflation, in 2009 the National Bank of Moldova had to grapple with the unprecedented pressure on the leu caused by the effects of the global crisis, compounded by domestic political uncertainties. With the National Bank adopting a more explicit policy of inflation targeting and declaring a less-managed exchange rate flotation in 2010, the leu experienced periods of high volatility. Although Moldova managed to avert a financial crisis, the recession affected banks' credit quality. The share of non-performing loans shot up to 16.3% by the end of 2009 and one medium-sized bank became insolvent in June 2009. In 2010, the situation in the banking sector improved and the share of non-performing loans decreased to 13.1% by the end of the year. Lending conditions worsened despite expansionary monetary policy pursued by the National Bank. While Moldova has made great strides in establishing a market economy since its independence, the economy remained overregulated and was hampered by government controls and corruption, creating very few additional jobs and forcing Moldovans over the years to migrate in increasing numbers to find work abroad. Moldova managed to maintain a tight fiscal policy over the years. However, as the global crisis hit the Moldovan economy hard in 2009, a year marked by two electoral campaigns, the country ran a deficit of 6.3% of GDP. In 2010, the government reduced the deficit to 2.5% of GDP. The economy continues to depend greatly on remittances sent from Moldovans working abroad. In 2008, remittances reached almost one-third of GDP, ranking among the highest in the world. After registering double-digit growth rates for most of the decade, in 2009 remittances fell 28.8%, reflecting plunging economic activity in countries with large numbers of Moldovan workers. The crisis exposed the vulnerability of the country's growth over the recent years. In 2010, remittances edged up 5.2%, but were still below the highest pre-crisis level. As the European Union expanded to Moldova's border with Romania's accession in 2007, the trickle of foreign direct investment (FDI) coming into the country grew to a record $861 million. However, FDI was less than one-third of that figure in 2009 and 2010. Cumulative FDI since independence is slightly more than $2.8 billion, far below the country's needs. Sporadic and ineffective enforcement of the law, bureaucratic obstacles, corruption, economic and political uncertainty, and government interference have discouraged greater FDI inflows. Worker remittances and higher energy prices fueled a consumption boom in recent years that has led to imports growing more rapidly than exports. Afflicted by trade deficits, the country lacks diversification in terms of sector development and export markets. After a contraction in foreign trade volumes a year before, in 2010 exports rebounded strongly but were overtaken by imports, leading to an expansion of the persistently high trade balance gap to 39.2% of GDP. In 2005, Russia enacted a ban on Moldovan agricultural products and in 2006, it banned imports of Moldovan wines. Although Russian President Putin announced an end to the wine ban in November 2006, actual resumption of wine exports came a year later. The wine ban was particularly painful because, prior to the ban, Moldovan wines accounted for one-third of the country's exports and 80% of wine exports went to Russia. Some Moldovan wineries have been successful in finding new, alternative markets for their products. The current Central European Free Trade Agreement (CEFTA) and EU autonomous trade preferences are incentives for further market diversification. As part of talks for an Association Agreement with the EU started on January 12, 2010, Moldova seeks to establish a deep and comprehensive free trade area with the EU. In 2010, Russia again took measures to restrict Moldovan wine, fruit, and vegetable exports — ostensibly due to food safety concerns. Some easing of these restrictions was reported in September. Moldova had an inconsistent relationship with the International Monetary Fund and World Bank until 2006 when the government reached an agreement with the IMF for a 3-year, $180 million Poverty Reduction and Growth Facility (PRGF) program. After the initial failure of negotiations for a new assistance agreement upon the expiration of the PRGF program, the IMF in January 2010 approved a 3-year combined Extended Credit Facility and Extended Fund Facility arrangement in the amount of $574 million for Moldova. This amount was supplemented by EUR 90 million (U.S. $125 million) of macro-financial assistance from the European Union. So far, the government is implementing the program successfully. Also, the government adopted the medium-term structural reform program Rethink Moldova, which received the support of international donors in 2010. A total of EUR 1.9 billion (U.S. $2.6 billion) was pledged in support for the period 2010-2013. Moldova has accepted all relevant arms control obligations of the former Soviet Union. On October 30, 1992, Moldova ratified the Conventional Armed Forces in Europe Treaty, which establishes comprehensive limits on key categories of conventional military equipment and provides for the destruction of weapons in excess of those limits. It acceded to the provisions of the nuclear Non-Proliferation Treaty in October 1994 and to the Biological Weapons Convention in December 2004. It does not have nuclear, biological, or chemical weapons. Moldova joined the North Atlantic Treaty Organization's Partnership for Peace on March 16, 1994. Due to Moldova's constitutional neutrality, it is not a participant in the Commonwealth of Independent States (CIS — a group of 12 former Soviet republics) Collective Security Agreement. Moldova's Parliament approved the country's membership in the Commonwealth of Independent States and a CIS charter on economic union in April 1994. In 1995, the country became the first former Soviet republic admitted to the Council of Europe. In addition to its membership in NATO's Partnership for Peace, Moldova also belongs to the United Nations, the OSCE, the North Atlantic Cooperation Council, the International Monetary Fund, the World Bank, and the European Bank for Reconstruction and Development. Moldova is a member of the World Trade Organization (WTO). In 1998, Moldova contributed to the founding of GUAM, a regional cooperative agreement made up of Georgia, Ukraine, and Azerbaijan, in addition to Moldova. Although the agreement initially included a declaration of mutual defense, Moldova has since declared its disinterest in participating in any GUAM-based mutual defense initiative. Moldova has been involved in information exchange, trade and transportation, border control, and energy projects issues within this regional agreement. In 2006, the organization's members voted to change the name to the Organization for Democracy and Economic Development — GUAM. The past 6 years have seen significant developments in Moldova's relations with the West. In 2005, the European Union (EU) appointed a Special Representative for Moldova and the European Commission opened an office in Chisinau. In February 2005, Brussels and Chisinau agreed on a European Union-Moldova Action Plan, a "roadmap" of reforms to strengthen the democratic and economic situation of the country and facilitate its Euro-Atlantic integration. In accordance with the 2005 Action Plan, Moldova has begun to harmonize its laws with those of the EU. Although Moldova has made some progress toward laying the structural and legislative foundation for reform, the EU has emphasized that more implementation is needed. In 2008, the EU proposed a new Eastern Partnership Initiative that would substantially upgrade the level of political engagement with Moldova and five other countries in the EU "neighborhood", including the prospect of a new generation of Association Agreements and increased financial assistance. Relations with the Russian Federation remain troubled because of the presence of Russian forces in the separatist Transnistria region, renewed restrictions on Moldovan exports to Russia, and reassessments of Moldova's history during the Soviet period. Following the dissolution of the Soviet Union, the United States recognized the independence of Moldova on December 25, 1991 and opened an Embassy in its capital, Chisinau, in March 1992. The current U.S. Ambassador to Moldova, Asif Chaudhry, arrived at post on September 24, 2008. A trade agreement providing reciprocal most-favored-nation tariff treatment became effective in July 1992. An Overseas Private Investment Corporation agreement, which encourages U.S. private investment by providing direct loans and loan guarantees, was signed in June 1992. A bilateral investment treaty was signed in April 1993. Generalized system of preferences status was granted in August 1995, and some Eximbank coverage became available in November 1995. Following the successful implementation of a $24.7 million Threshold Country Program with the U.S. Millennium Challenge Corporation (MCC), Secretary of State Hillary Clinton and Moldovan Prime Minister Vlad Filat in January 2010 signed a new $262 million 5-year Millennium Challenge Corporation Compact for economic development and investment projects in irrigation infrastructure, high-value agricultural production, and road rehabilitation. The agriculture project will help stimulate the production and improved marketing of high-value agricultural products, including fruit and vegetables. The project includes plans to provide reliable water for agriculture by repairing up to 11 large irrigation systems servicing 15,500 hectares. The project also includes improving access to credit for agricultural projects, and a technical assistance package co-financed by the U.S. Agency for International Development will support related investments by farmers and entrepreneurs in the shift to higher-value agriculture production, post-harvest processing, storage, and marketing. The new agreement includes a road rehabilitation project that will repair a 93-kilometer section of a major highway in the northeast of the country. The highway is a key link for passenger travel and for internal commerce and trade. The visits of Vice President Joseph Biden in Mach 2011, and of Senator John McCain in June reinforced U.S. support for Moldova's efforts in democratization, its EU aspirations, and its sovereignty and territorial integrity. The U.S. Embassy (http://moldova.usembassy.gov/) in Moldova is at Strada Alexei Mateevici #103, Chisinau (tel: 373-22-40-83-00/23-37-72; fax: 373-22-23-30-44).